Ask your local MP a simple question and be surprised about a complicated answer. The Radical Royalist happens to be a resident of the Melbourne constituency of "Higgins". For many years former federal treasurer Peter Costello was the member of Parliament for "Higgins" and he received a couple of letters and blog entries from the Radical Royalist since the wannabee successor of former PM John Howard was an avowed republican. But Peter Costello is long gone and his seat was inherited by Kelly O'Dwyer. With the approaching birthday of Queen Elizabeth II, Queen of Australia, the Radical Royalist asked Ms O'Dwyer, what kind of celebrations for the Australian monarch will take place in the constituency of "Higgins". "I am a great admirer of Her Majesty, despite being a Republican, and I gave a speech in her Honour which you can read here. "As you might be aware, the Governor-General and Lady Cosgrove have accepted an invitation from Her Majesty to be present in London for official commemorations on the Queen’s Birthday long weekend in June and, again as you might be aware, Australia Post will mark this significant occasion by releasing commemorative stamps". It is rather odd to refer to a speech held on 9th February 2012, when being asked about events in 2016. And although it is a great honour that the Australian Governor-General and his wife have been invited to London, that does not solve the problem that obviously Ms O'Dwyer does not intend to do anything in the constituency of "Higgins". May be she is too busy to prepare a celebration for herself. Today The Sunday Age published a report on the Fundraiser for Assistant Treasurer Kelly O'Dwyer to be sponsored by NAB amid banking firestorm. "A major bank will help foot the bill for a glitzy pre-election political fundraiser to be fronted by Treasurer Scott Morrison and his deputy Kelly O'Dwyer at the same time as they are resisting calls for a royal commission into the scandal-plagued banking sector. "The $1200 to $2500-a-table breakfast, scheduled for 10 days after Mr Morrison delivers his first budget, will be held under the banner of co-sponsor National Australia Bank. "NAB is one of two corporate sponsors for the May 13 event organised by the Higgins 200 Club, a fundraising body that supports Ms O'Dwyer, the federal member for Higgins. "Tickets for the fundraiser start at $150 per head and a table of 10 at the event starts at $1200 for Higgins 200 Club members and $1350 for non-members, while "premium corporate tables" at the event cost $2500. "Based on the capacity of the Palladium Room, which has hosted the Logie Awards, the event could raise $100,000 to $150,0000 before venue hire and catering is subtracted." 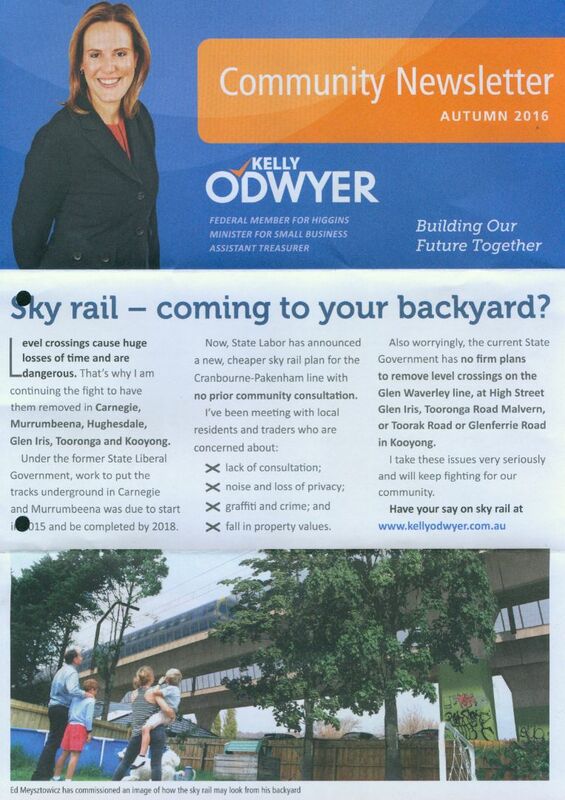 In her newsletter for the local residents Kelly O'Dwyer MP has no space left for the Queen of Australia. The Age reported on 14th June 2016 that Kelly O'Dwyer might lose her seat to the Greens: Mirabella-style loss looms in Higgins. Without a seat she would be free to pursue her republicanism.